Sorry y’all! I’ve been swamped from travel jobs, to weddings, to diving into the real estate market to officially be a homeowner! I know there are no excuses other than just pure laziness and some times negligence of the site is the real reason why I don’t have a post. Granted, where I am currently…there is absolutely NOTHING to write home about. I am currently deployed to Nowhere, USA for a job and just miserable. – There is nothing but corn and soybean fields around the town I’m in. – More than half of the businesses in the town are closed and only an empty building sits. – Options for food are mainly nationwide chains. – The few “local” shops have provided to be severely disappointing (even with extremely low expectations), or just too sketchy to eat. Again, this is another post where I wondered to myself: why have I not posted about this place?! I visit Amarin Thai in Mira Mesa at LEAST once a month, if not more. This tiny restaurant comes out with banging food. Now is it authentic? I may have to defer that judgment to domeone who would know because I have never had Thai from the homeland. However, if you are in the market for a great meal then continue reading! The restaurant is a tiny space, tucked in the back corner of a little food court in the business district on Mira Mesa boulevard. There is never more than 2 servers in the front of the house, and 2 people in the back of the house. And regardless of the day of the week, lunch or dinner, they have a steady stream of business. I’d like to think I help contribute towards the life of the restaurant. 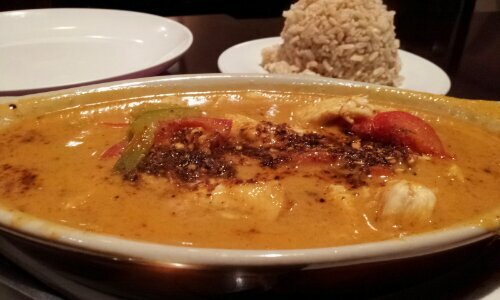 Panang Curry with Chicken and side of brown rice for LKB. Drunken Noodles with Mock Duck for myself. Our choice of spice levels that night: 8\10. I would warn to others to air on the side of caution here because when you ask for spicy, they WILL give you spicy! What you can do if you find that it’s not spicy enough, ask for the spices afterwards and they will provide for you a tray of all the different kinds of heat for you to choose from. Consistently great, tasting food. They hit the spice note (not spicy mind you! ), so it will never be subjected to the blasphemy of bland food syndrome. When you ask for spicy, they will burn you if you’re not careful. And they have friendly staff that helps serve you a delicious meal at such good prices, you feel like a thief at times. Go for a quick lunch, a casual dinner, or take out, you will find yourself happier…and maybe in search for some milk or ice cream to cool that raging fire within. Due to my travels in the past couple of months in pretty much all of the mid-west, I had nothing but American cuisine. It was only then did I realized that I need to have a good dose of Asian and/or ethnic food. I love seafood, pasta, salads, and sandwiches, but I can only eat so much of it! Also, I didn’t realize that American cuisine does not include spices and they don’t seem to like spicy foods. 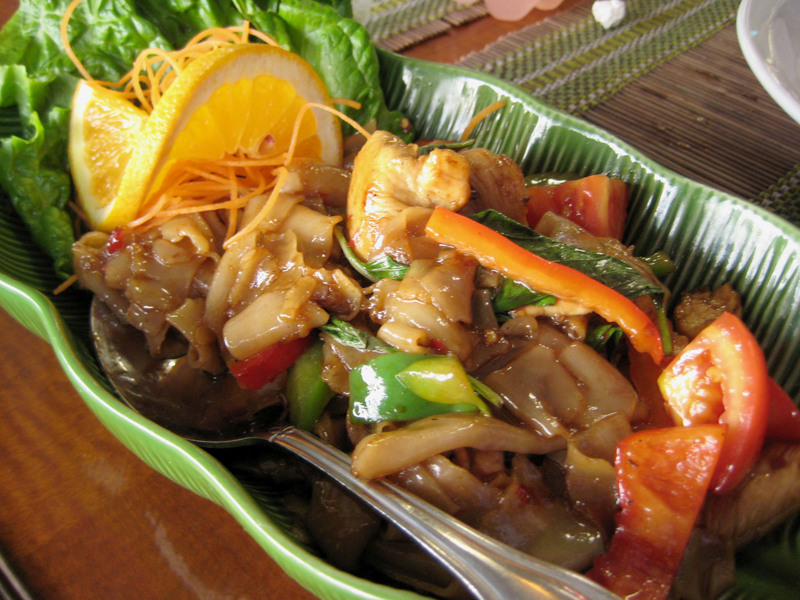 I think because of the sheer lack of ethnic, flavorful, and spicy foods, I had the greatest cravings for Thai food. Whenever I returned home, all I wanted to eat was: Thai food, tofu, rice noodles, and veggie burgers (or any meat alternatives). My diet was so off balance that I ate a ridiculous amount of Thai food. 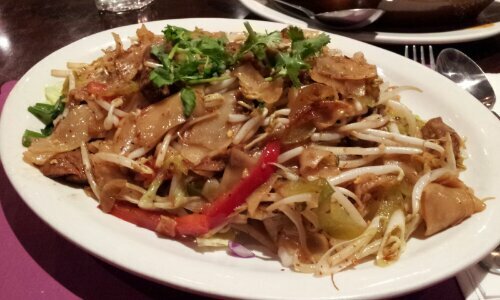 One of the places I gorged at was Thai Pepper Cuisine. It’s in Serra Mesa, just outside of the neighborhood area. It’s a small little place that packs a great punch of flavors! 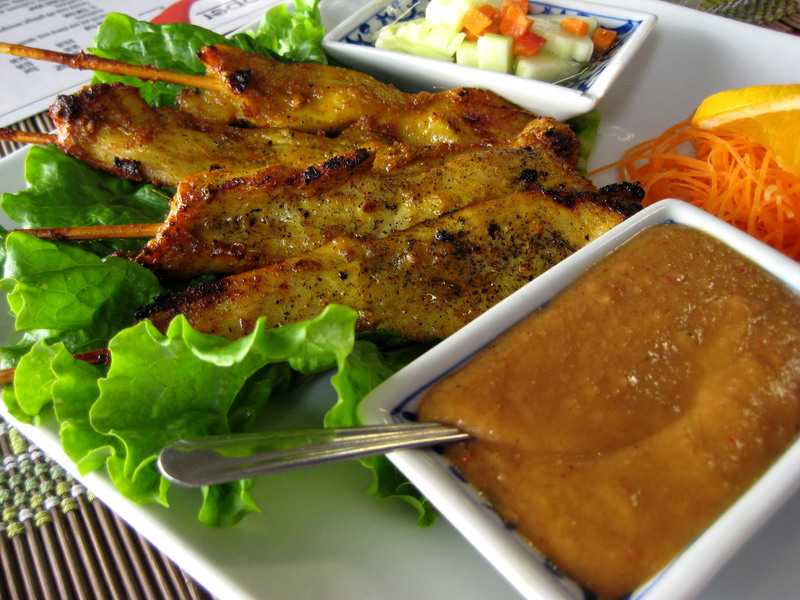 Chicken Satay with peanut dressing. I usually don’t order this dish because the chicken gets dried out all too often. However, this place can cook their chicken! My goodness, it was so tender, moist, and packed with curry flavor! There was no need to even dip it the peanut sauce, but the sauce was really good too. The Spicy Fried Rice with Scallops was great, but the scallops were overcooked. It was exactly as I had feared yet I should know better. 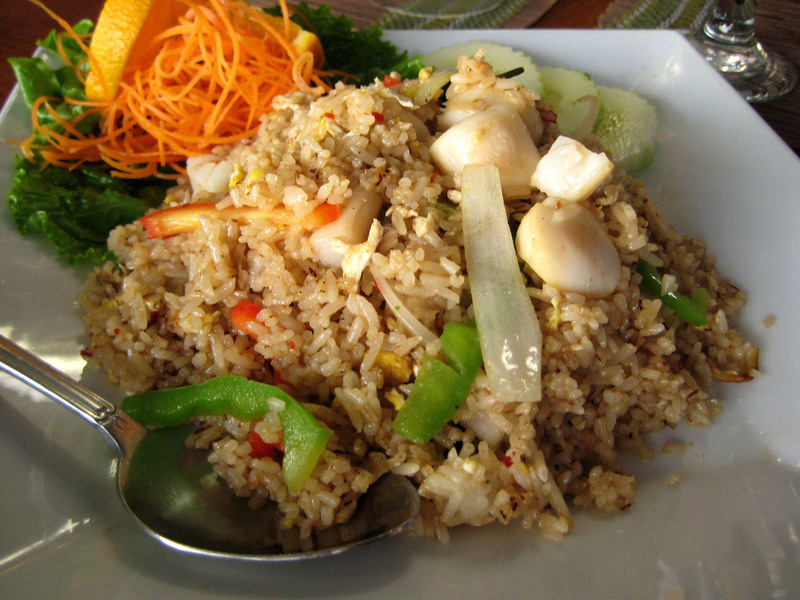 However, scallops aside, the fried rice was amazing and spicy! I should have just tried a different protein but I was hopeful that scallops would hold up in the Green Curry. 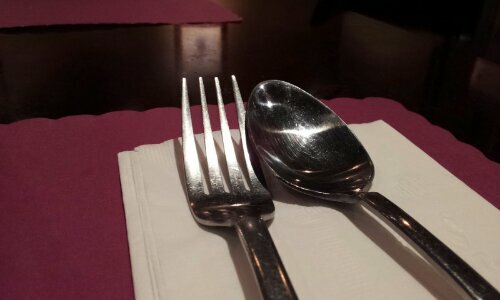 It did not sadly, but the curry was rich and flavorful. Once again, I asked for this to be SPICY and boy it was! Curries seem to have this spell binding effect on diners because you just get sucked in. You want more and more, but you need a vehicle to enjoy it and you can’t stop eating even when you’re full. The scallops were put aside and I thoroughly enjoyed the curry with bamboo, bell peppers, eggplant, and basil. 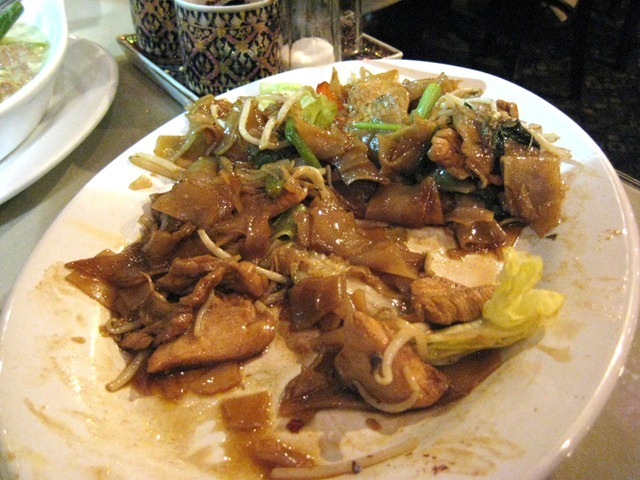 CP will always get his drunken noodles with chicken and this time was no exception. The noodles here was a little more wet then I’m used to, but it was still good. I had a bite and let CP gobble the rest up since I had my other 2 dishes. CP gave this version 2 thumbs up. My family and I decided to try the only Thai Buffet that I have ever seen anywhere. Thai Cafe in Clairemont has been there for many years, yet I’ve never set foot in it much less try it. So finally today, with a coupon for 75 cent Thai tea/coffee, we gave this place a try. We tried both their Thai tea and coffee. The Thai tea was pretty good, not too sweet nor too watered down. The Thai coffee was decent, but it lacked some of flavors of a true Thai coffee. The best one that I’ve had is still a Thai restaurant in Rowland Heights. My 1st plate had: (I don’t remember the actual names) spicy beans, tofu with a peanut sauce, fried spicy squid, and spicy noodle. The tofu and spicy noodle was hands down, the best tasting items, followed closely by the squid. The noodles had just the right amount of spice and the noodles weren’t sticky and cooked al dente. The tofu was good due to the sauce. I love peanut ANYTHING. Had it been fresh, it probably would’ve been even better. And during the course of the meal, I saw a new tray of spicy noodles being brought out, which I quickly went to retrieve some! Here was my 2nd plate: red curry, krab salad, some mushrooms, and more of the tofu. The red curry was very tasty. I didn’t get any of the chicken because I find that thai restaurants tend to over cook chicken til they are bone dry, but I did get the eggplant, which was delicious. 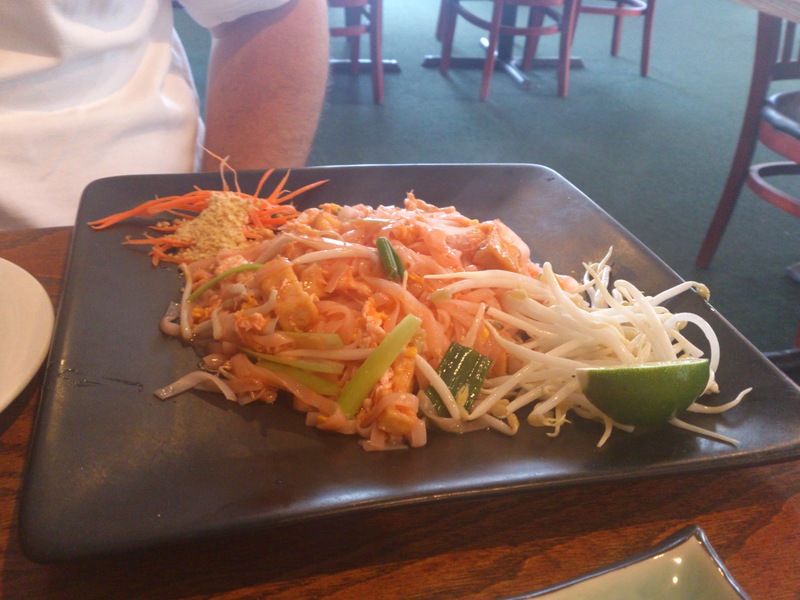 Here’s a plate of fresh pad thai that everyone shared. Even tho it was fresh, it lacked any flavor and just not worth eating, but my dad finished it off. According to him, it was one of the best…I guess we really do have different tastebuds. They had fresh spring rolls (as well as fried). On the buffet line, they were out so we asked one of the waiters if there was going to be anymore, the waiter went and asked the cook in the kitchen. Who then came out and told us that he’ll make us some right now and asked us how many we wanted! Wow, now that’s customer service! Well, as promised, the cook made the rolls and BROUGHT it to our table! It was so nice of them to do that. 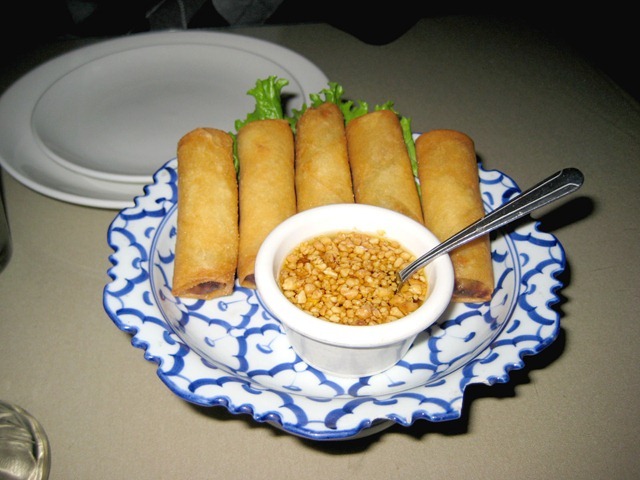 And the spring roll?…It was really good! The rice wrap was so fresh, and inside contained: cucumber, rice noodle, minced chicken, carrots, and cilantro. Yummy! 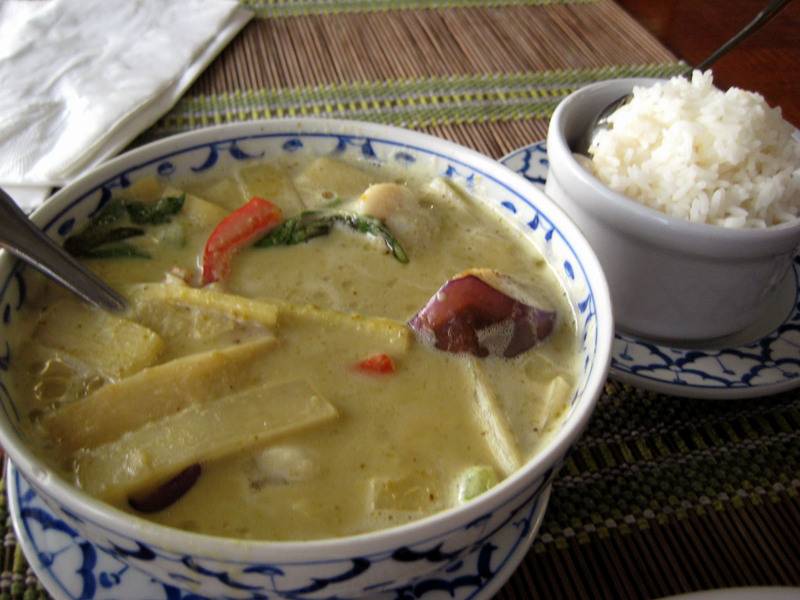 So my overall impression of Thai Cafe?….I would definitely come back, but only during their rush hours. When fresh, the food is fairly good. And at $6.99 for lunch, plus 75 cent drinks (w/ coupon from SDreader) it’s a steal! Give it a try!